New Mexico State University ’11 graduate Kellie Ann Jurado is one of only five women awarded the 2017 For Women in Science Fellowship from L’Oréal USA. Jurado, currently in a postdoctoral program at Yale University, received the $60,000 fellowship. Jurado grew up with her father, a chile farmer in the Mesilla Valley, and her mother, a small business owner, in Roswell. The idea of becoming a scientist was not initially on her radar. The fellowship program has awarded 70 postdoctoral women scientists more than $3.5 million in grants over the past 14 years and will fund Jurado’s research on Zika virus pathogenesis and allow her to attend conferences. It will also support her continued efforts on a community education campaign that promotes the uptake of the HPV vaccine, which helps prevent HPV-caused cancer. This is in collaboration with her husband Michael Simoni, who is an obstetrics/gynecology resident physician at Yale University. 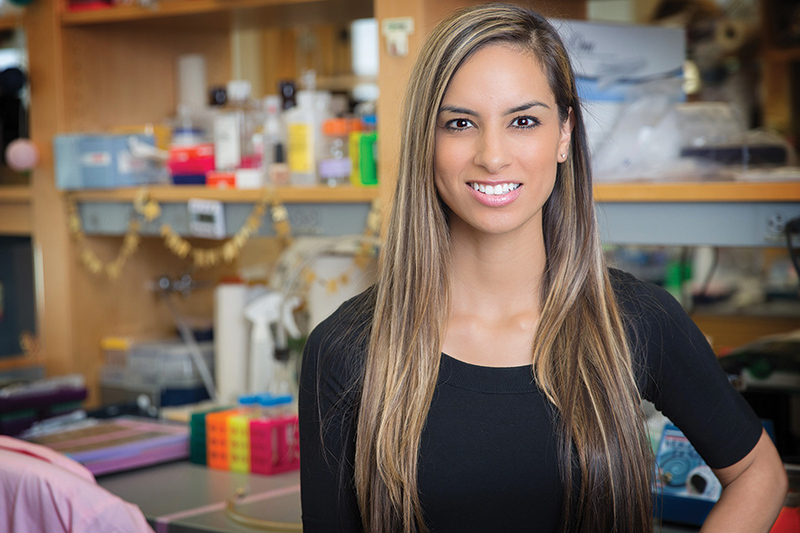 Earning a doctorate was the natural next step for Jurado, who chose Harvard University to earn her degree in biology. She feels it’s important for NMSU students to dream big. Kellie Ann Jurado is conducting research on Zika virus pathogenesis and supports a community education campaign promoting the HPV vaccine.